With West Ham powerbrokers David Gold and David Sullivan backing Sam Allardyce to get the Hammers out of English Premier League trouble, Aston Villa boss Paul Lambert is attractively priced at odds of 7.00 with Bwin to be the manager in England’s top flight to leave his post. Allardyce is not 100 per cent safe as West Ham boss – the Hammers are only out of the English Premier League bottom three on goal difference and, as everyone keeps saying, it is a multi-million business staying in England’s top flight – but having seen his team win 2-0 at Cardiff to leapfrog the Bluebirds one cannot understand why bookmakers are offering the manager known as Big Sam at short odds. Odds on in some places and no bigger than 2.25 with any bookmaker, Allardyce is underpriced to be the next English Premier League boss to leave his post. It is getting to the time of the season when managers, even those under pressure, have a good chance of staying the distance. But surely if there is going to be another sacking, Lambert is the strongest candidate of the 20 top-flight supremos. Twelve months ago, bookmakers made the mistake of placing too little faith in Aston Villa owner Randy Lerner and his solidarity with Lambert. Bookmakers made the mistake of not doing sufficient research into Lerner’s history regarding hiring and firing senior employees and ended up offering overly generous odds about the American businessman keeping Lambert on staff even though Aston Villa’s results were bad. Now bookmakers are probably making the opposite mistake and placing too much faith in Lerner sticking solid with Lambert as Aston Villa slide down the English Premier League and come to terms with bowing out of the English FA Cup to Sheffield United, one of English League One’s strugglers. There are many reasons why Lambert is under pressure. Aston Villa has the worst English Premier League home record in terms of points per game so Villans supporters have seen lots of poor performances. Aston Villa has won two, drawn two and lost seven of its 11 English Premier League home matches for a points-per-game tally of 0.73. That is both relegation form and a catalyst for fan discontent. Lambert is out of goodwill credits with Lerner after the American stood by the Scot this time last term. Lerner did not become an incredibly wealthy man by allowing sentiment to sway his decisions and, with Lambert in his second season as Aston Villa boss, he cannot say with any seriousness that he has not had time to make the Villans into a decent side. And then there is Aston Villa’s upcoming fixtures, which provide the potential for heavy away losses, disappointing results against relegation candidates and a derby defeat. Aston Villa’s next five English Premier League matches are away to Liverpool, home to West Bromwich, away to Everton, home to West Ham and away to Cardiff. Liverpool has dropped only three home points this term and Luis Suarez is scoring goals for fun, making the possibility of Aston Villa copping an Anfield hiding distinctly possible. West Bromwich will have a fairly new boss going into its derby game at Villa Park. Everton has lost only once at Goodison Park this term. And, while neither Cardiff nor West Ham, is in form, the implication of its matches versus Aston Villa are obvious. Lambert’s language in recent weeks has been different to what it was at this time last season. Lambert says that he fears for his job right now. Twelve months ago, Lambert was confident that Lerner would not show him the door. The relationship between Aston Villa’s owner and manager is strong and genuine but football is a results business. 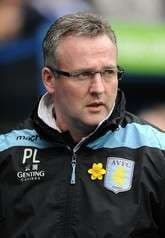 Maybe Lambert does not deserve to be the favourite to be the next English Premier League manager to leave his post. But Lambert is, arguably, under more pressure than Norwich boss Chris Hughton, and Allardyce is safer than his odds suggest.